Casey County Baptist Association as been serving the community since 2005. Our world is changing rapidly. So fast, in fact, that the world we lived in last year isn't the same as the world we live in this year and it will be even different next year. If your ear is to the ground, then you know: Our society, our culture, our schools and our kids are changing right now and real fast. We need to be praying for our country at a time when it seems to be spiraling out of control with so much hatred and violence. Praying for our kids that are growing up that their world will be a much better time than present. All request will be available after being checked for proper content. This is is to keep improper words being posted. All post will be available within 24 hrs unless marked private.  Please Note: We reserve the right to delete comments that are offensive, uncivil and off-topic. Birthdays February: Shirley Reed, Ashley White, Ben and Gracie Beeler, Haley Durham, Brandy Carman, Lexi Harlan, Ronald Allen , Retha Jean Hogue, Zach Carman, Kaden Haste, Jason and Logan Publow. Norreen Gentry, Anna Lucas, Angie and Matt Murphy, Charlie Turner , Mabel Raines, Terry Wethington, Jim Coffman, Howard Vanoy , Neal King. Aiden Easterling, Cole, Jasper Russell, Walker Coffman, Quentin Allen, Clay Cannon, Cody Rushing, Carl Staton, Kylie Cosner, Dallas Russell, Edna Allen, Cheyenne Gosser, Denita Popplewell, Rebecca Baldock, Connie Murphy, Pat Brown. Willidean Gilpin and Clayton Crowley. CCBA Executive Board meeting at Poplar Springs Baptist., April 07, 2019 at 2:00 PM. Casey County Baptist Association 5th Sunday Hymn singing will be at Poplar Grove, Sunday, March 31st at 6:00 pm. For more information: Pastor: Bro. Brent Huggins (cell) 606-669-5768; Church: 606-787-8838. Note: A portion of Upper Brush Creek Road is closed until April. Drivers should seek another route, such as off of Woodrum Ridge, Loop Road, Snake Ridge or Reynolds Creek, Shucks Creek, or turning left onto Chelf Ridge at the Brush Creek Fire Department. 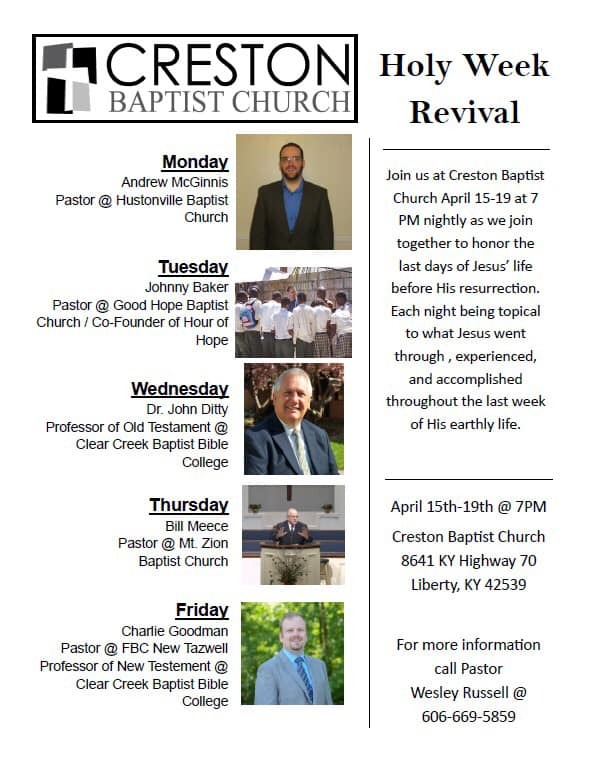 Creston Baptist Church - Holy Week Revival, There will also be special music each night! April 15-19, 2019 at 7:00 PM For more information call Pastor Wesley Russell @ 606-669-5859 ----------------------------------------------------------------------------------------------------------– The Soup Kitchen in Liberty, KY, this Friday soup kitchen is serving to those in need from 4 to 6 p.m. at 1 Pettyjohn St. in Liberty (behind the firehouse beside CU). Best Built Buildings will be serving chicken dumplings, cornbread muffins, and a desert. For more information, contact Kevin Pittman at 606-448-9746. Gary Johnson appreciation day April 12, 6 to 8 p.m. at the Pork Producers Building. Free food, fun, fellowship and Bluegrass Gospel Music. Lights of Liberty Theatre will host a night of Bluegrass singing on Saturday ,April 13th at 7:00 pm. Singing will featuring local talent. Hello CCBA Pastors, My name is Anne Polston and I am working with Russell Shaffer for the National Day of Prayer on May 2nd. We were wondering if you and your church would like to participate in prayer at the Judicial Center. Please call me at your earliest convenience at 606-787-2768. Thank you. A new soup kitchen is serving to those in need every Friday from 4 to 6 p.m. at 1 Pettyjohn St. in Liberty (behind the firehouse beside CU). For more information, contact Kevin Pittman at 606-448-9746. If you’re a Casey County resident, we would love for you to take part in this survey. It is a short, 5 question, completely anonymous survey that will help us help you more! Please share! For information on upcoming events check the Association Event Calendar. Our goal is to provide you with information about our association and the work we are doing here in Casey County and the part we play in furthering the ministry of Christ. We believe that a outreach in the county, state, and the world in which we live is crucial to the growth and advancement of God's kingdom. 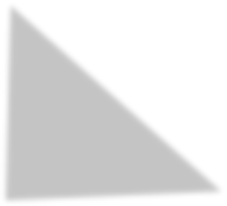 As you browse our site you will discover all about our efforts and services offered by us or a sister church. If you have comments or questions about our programs, services or simply need more information and would like to contact us, click the contact listing page with in the site or at the bottom. Thank you for visiting and we look forward to serving and worshiping with you in one of our sister churches. We are grateful for all the church pastors who work so hard for so little in momentary rewards. Often neglecting their own physical and spiritual needs to serve and sacrifice time with their families. We often take them for granted and assume any time we need them for sickness and emotional and spiritual needs they will be there 24/7 and most often times are. Pray for your pastor today and every day. They are generals in God's army and their war wounds are physical, emotional and spiritual. Be someone that encourages and inspires instead of sowing heartache and division. Thank You for your service to Christ and your Church. You’re Casey County Baptist Associational.